These are notes taken by a participant at the time. Hopefully there’s enough in them to give some lead-ins to further thought. 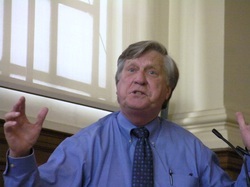 Long's aim: To address the practicalities of the craft of preaching. Recognize our changed social environment – previously preachers used one ‘voice’ speaking in one way to a congregation basically united in outlook and expectation. Now there are always multiple constituencies in every congregation and the preacher has to use multiple voices. Most congregations now have ‘saints,’ ‘seekers’ and those ‘just there’ – which element should the preacher speak to? Those who put church growth first say ‘the seekers’ and preaching is emptied to the common denominator the uninitiated can understand. Those eager to assert the distinctiveness of the faith say speak to ‘the saints’ and let the others overhear if they are able. There is, however, a third possibility: Recognize the diversity and speak to all the constituencies (in turn) – this is the method adopted by Saint Augustine (see book by William Harmless). Let the environment of overhearing be cultivated to the benefit of all – let a compelling way of life be opened up in the sermon. We’ve moved beyond the deduction/induction divide. All the categories of Augustine sermonic rhetoric apply – teach, delight and persuade. Be alert to what’s communicated indirectly. See work on differences in reporting of Titanic’s loss (1912) and the loss of The Challenger space shuttle (1986) – in the first theological categories were frequently used in the second not so. Society seems to have lost the vocabulary of Christian theology. Representative of the fact we no longer known how to live a Christian life. The narrative methodology so popular in recent preaching is more and more criticised (“man does not live by narrative alone”) – wisdom thought is the emerging focus – that which is deeply theological and practical. tablets– they have religious sensibilities but they are more Gnostic than orthodox Christian forms – not sin but incompletion, not grace but knowledge, not embodiment (incarnation) but ideas. Gnostic don’t like embodiment – so creeds, institutions, aging, buildings are all suspect and said to be elitist. Every sermon becomes inter-faith dialogue! In response preaching needs to get ‘smaller,’ to be part of a wider drama of worship in which testimony can be amplified. ‘I preach like I want them to speak.’ Let preaching empower speech activity ‘put there.’ We have to practice the capacity to talk about faith in Christ; if we don’t practice it ,it will die. Sermons should be one speech event amongst thousands – all giving expression to faith. kept. (People listen faster than you can talk). Listeners need follow-able transitions – give signs that one section has closed and another is beginning. rich piece of the thing itself), or metaphor (but remember multiple meanings make them dangerous! Perhaps best used at the beginning so that threads can be teased out through the sermon. Listeners need variety – don’t just stay with the style that’s natural to you the preacher.